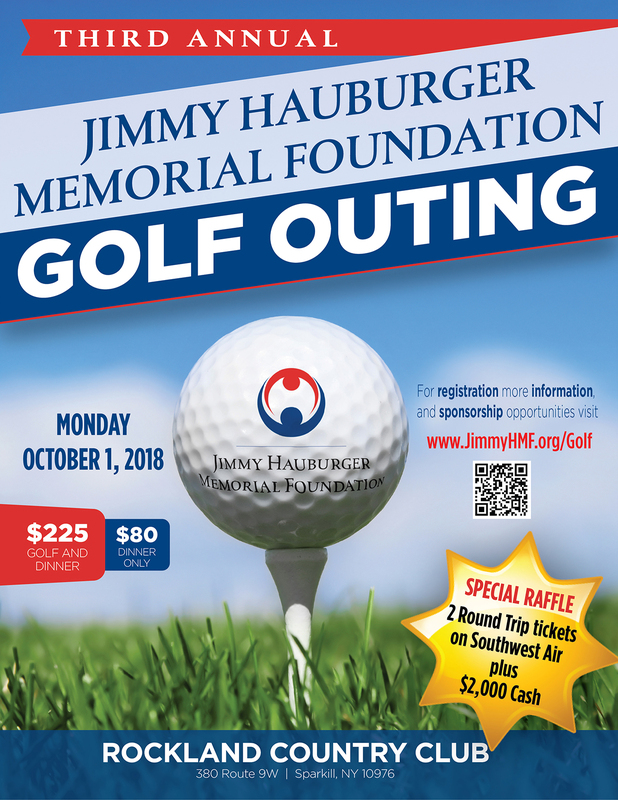 Registration is now open for the Third Annual Jimmy Hauburger Memorial Foundation Golf Outing held at Rockland Country Club on October 1, 2018. Registration for the Third Annual, 2018 Jimmy Hauburger Memorial Golf Outing are first come, first served and limited to 128 golfers. Please be advised that golfer registration fills up early. The JHMF board recommends that registration submitted as soon as possible to secure a spot on a foursome. 2 round trip Tickets to anywhere in the continental United States on Southwest Airlines plus $2000 cash. The Jimmy Hauburger Memorial Foundation Board of Trustees would like to thank the following sponsors for their commitment to the 2018 JHMF Golf Outing. Sponsorships are available on a first-come, first-served basis. Includes signage in the clubhouse, signage on the course, and 2 foursomes. Includes signage in the clubhouse, signage on the course, and 1 foursome. Includes signage in the clubhouse and 1 foursome. Includes logo on shirt sleeve and 1 foursome. Includes signage in the clubhouse. Includes signage on the beverage cart. Includes signage in the lunch shack at the turn. Exclusive signage at tee and green of 1 par 3 hole. Includes signage at a tee or green on the course. All sponsorships include signage online and on event related marketing materials.